I would joke with my engineering friends in college that we were receiving degrees in online shopping. The pattern for many of my classes and projects was to dig through McMaster or Digikey Monday and Tuesday, pay an arm and a leg for components to arrive by Thursday morning, and then spend a day and a half frantically using the tools at hand to hack everything together in advance of a Friday design review – repeat. That was likely a best-case scenario: I remember waiting three excruciating weeks for circuit boards to arrive, planning entire projects around these sorts of long critical lead times. It may go without saying that since I moved to China in the fall of 2015 and learned the ropes of Shenzhen that virtually every piece of the “making” process has changed for me. By no means am I cured of my American ways – almost two years later I’m still finding ways to challenge my understanding of what might be possible for a given project. But looking back, these are a few of the key areas in which I have learned to adjust my expectations for the better. 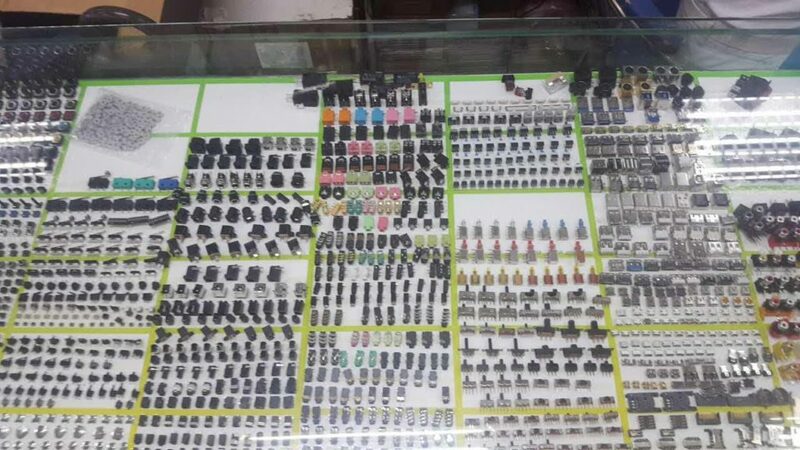 Components: When sourcing tens of components from the markets for prototyping work, I expect to pay a nominal price of 5 – 10 RMB ($0.75 – $1.50) for whatever quantity I’m receiving. When shopping online for either components or larger sub-modules (recently AC/DC power supplies, camera units) I like to follow my own rule of thumb that the raw number for price on the US and Chinese internets should be the same, just with the US price being in dollars and the Chinese price in RMB (1USD = 6.7RMB). Circuit boards: $7.42 for two day service on a 10X10cm board, quantity 10. $22.25 for 24 hour rush. Usually $15 increases for larger boards/thicker copper/additional layers. SLA prints: Recently quoted on a 12 piece kit to assemble into a complex 2′ tall device. $170. Molds: Aluminum mold for a 12”X8”X0.5” silicone part. $700. Tools: Not only are parts cheap, but conveniently so are the right tools to use them. We have a rule in the office that is if you need a tool and it is less than 100RMB ($15), don’t ask just buy it. I don’t get asked much. Even more complicated tools – soldering stations, oscilloscopes – can be had for roughly $40 and $250 respectively. While savings and quick decision making are obvious benefits, another aspect to the low prices in Shenzhen is that you are often working with close to volume prices from the beginning of a project. This allows you to develop a sense of the final costs associated as you are prototyping, as opposed to in some subsequent design for manufacturing step. 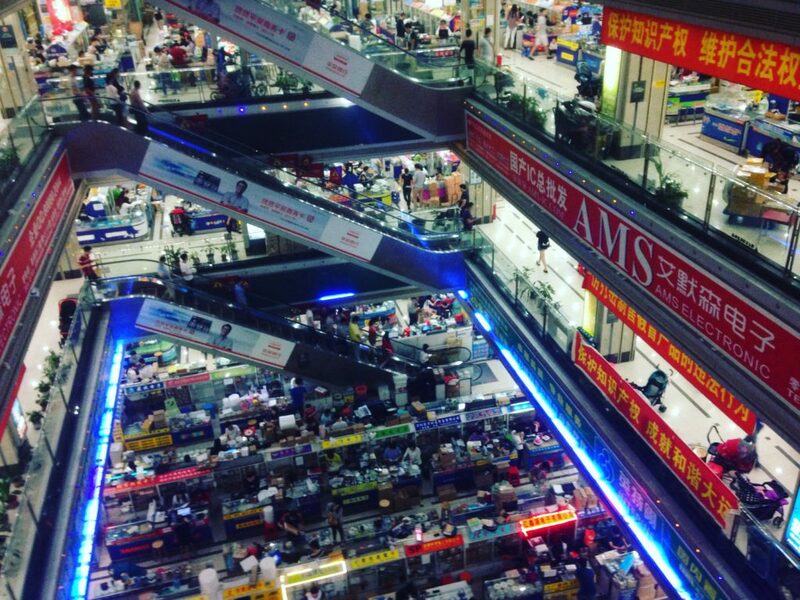 Electronics markets: 10AM – 6PM daily. 15 minute subway ride from our office. Taobao shipping: Overnight from anywhere between Shenzhen and Guangzhou (which can be most things). 2-3 days from anywhere in China. Circuit boards: 36 hour rush, 60 hours standard (with shipping time included). If anything, a challenge I have discovered for myself is that in reducing lead times I have lost the natural breaks in projects to plan and research next steps. Now I must at times consciously slow my process down. Something else we’ve been exploring recently is using shipping as a form of communication. With the ability to send a package overnight anywhere in the province for about $2 (with office pickup), we’ve taken to exchanging physical samples with suppliers instead of email or photos. This was very helpful in recently working through questions and feedback with a factory on a custom enclosure project. 1. With the right tools and setup, prototype parts are both consistent and at high quality. When receiving samples, you can confidently move forward and check designs without worrying about underlying craftsmanship. 2. In most cases, the process to specify or create a sample with a factory is the same or very similar to that for volume production. By working with a partner right away, supplier identification and design for manufacturing steps are taken care of early on in the design process. This process has been particularly helpful in working with enclosures (metal and plastic), coatings (PCBs, painting), and custom connectors and wire harnesses. What I find are the steps I still do myself, such as circuit board assembly, are the pieces I want to do in order to test and learn as I go. Further, I have recently been challenging myself to think less “what is available and how do I modify it for my use?” and more “what would be an ideal solution and who can I work with to make that happen?”. In general we have found factories are willing to try new things if we can help them think through the steps to accomplish that goal. 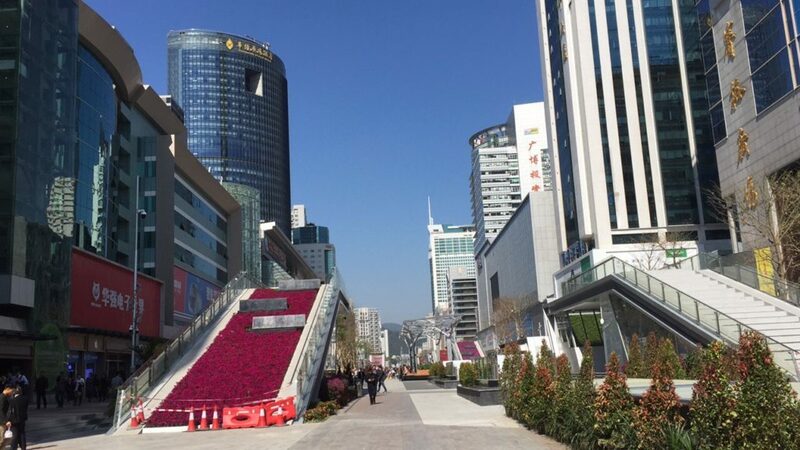 Working in Shenzhen, I would not necessarily say “everything” is equally available. What you find instead are suppliers, both in the markets and then more broadly in the Chinese economy, clustering around the most commonly used components and products. Coming from 10,000 plus search results on Mouser or Digikey when looking for a single diode, this simplification can be very helpful in informing design choices. By working from these more common components, you are often getting robust, well known parts, that are interchangeable from a number of different suppliers. As a bonus, they often also come at the lowest prices. That said, if you do want a specific version of a chip or special connector, the right market contacts can usually find it for you in a period of 20 minutes – long enough to grab another component on the list, or more often than not another milk tea. 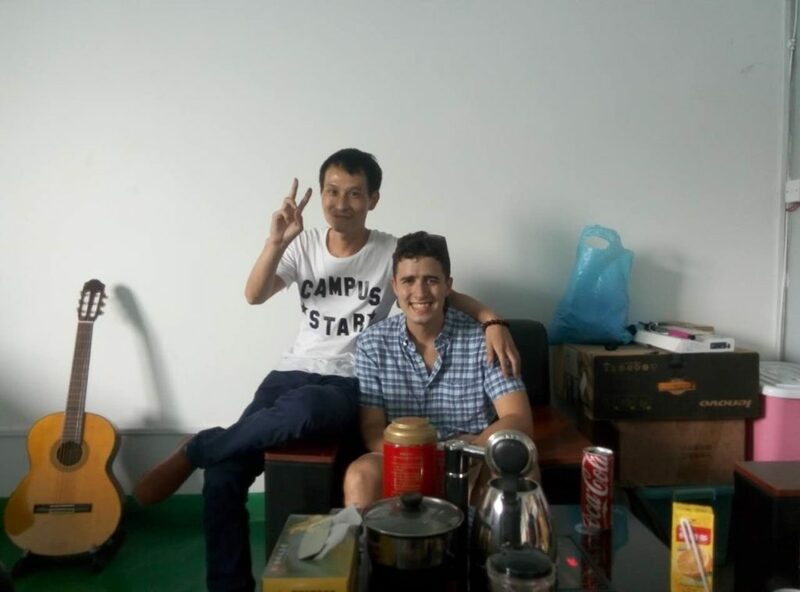 Gordon McCambridge is an Engineering Consultant at Pivo.t, living and working in Shenzhen, China. You can reach him at gordon@pivo.tc.